Last week, Principal Artist Jeff Toney gave us a glimpse into the evolution of Bartleby through a series of original art concepts. This week in part 2, Jeff shares how Bartleby turned from a 2d drawing into a 3d model! After the round of concepts, we had several ideas that solidified what we wanted with our magical tree. We wanted a face that had an old, wise look in the side of the tree. Bartleby also needed a rough moustache of bark growing around his mouth to mark the entrance of his teleporter to other worlds in the Spiral. With this in mind, I sketched out a rough idea about Bartleby and the surrounding schools in Ravenwood. I made this sketch to show people what I planned to model, and then was given comments and suggestions to make this a better model. Since making a video game is a team project, having easy steps to see the progress as it is happening is always good. It is much easier (and cheaper) to make changes in the sketch, then it is to make them after we go to a 3D model in the game. After some revisions, my sketch was approved and I could then go to the 3D model! 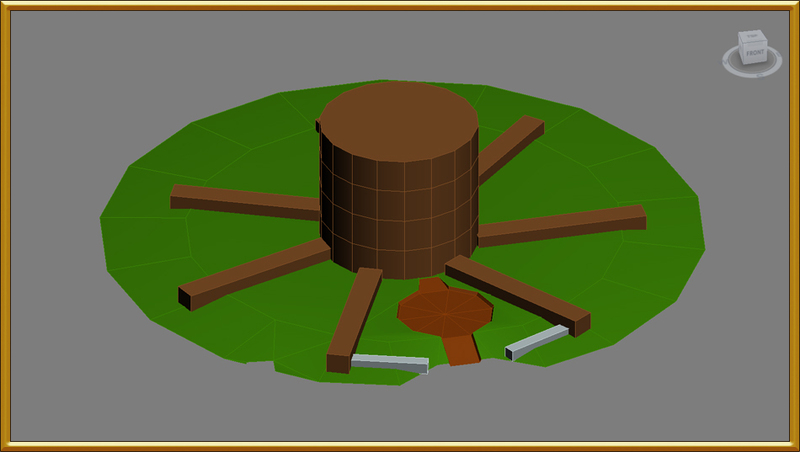 At KingsIsle we use 3D Studio Max for all of our modeling work in the game. It is a versatile program that is used in many video game studios. When you start modeling, you always begin with a basic object that is closest to your final model. For a building I would start with a box, but since Bartleby is round I started with a cylinder. At this stage, all we wanted is a simple shape of Bartleby. We call this a “proxy”. The proxy is the next stage in the process from translating the sketch we created to a final 3D model. 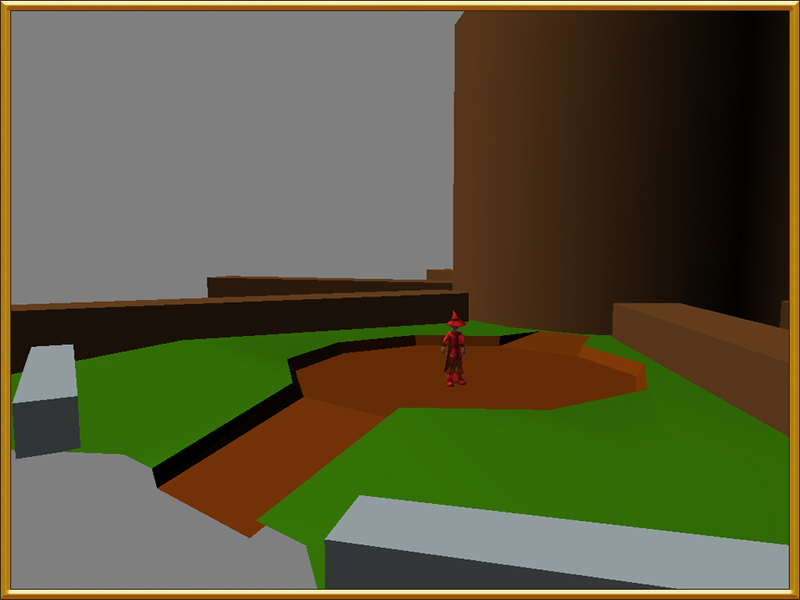 Using this Bartleby proxy, we could walk around it in our level editor and see if we liked the size and shape of the object so far. Looks good! The size of the tree feels good and the tree roots are not too small. I imagined myself as a player walking up to Bartleby for the first time. I should feel some awe in such a great, big, magical tree but he should also have a sense of peace around him. He is, after all, the source of all magic in the Spiral. Next, we started moving polygons around. Polygons are 3D virtual triangles that make up everything in an object. They are made up of points in 3D space called vertices. The surface of the triangle is called a polygon. 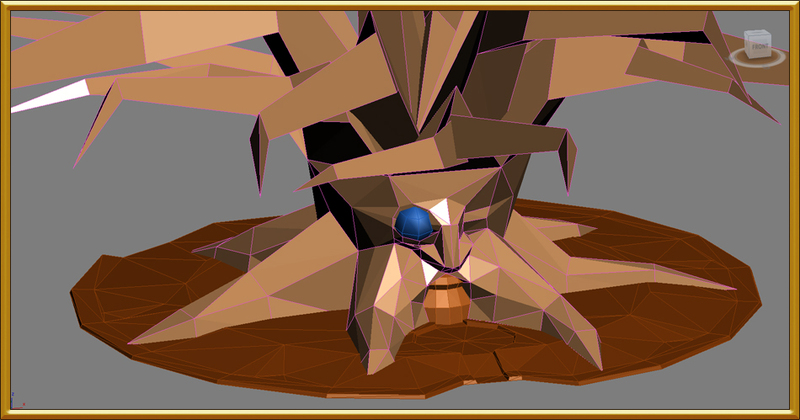 The more polygons you have in a tree, the more “smooth” the surface of the tree will be. Think of this as “virtual clay”. Since there is only one Bartleby in the scene (as opposed to 5 different school buildings and tens of trees around the level), we could make him have some more polygons to his face and branches and roots than other, smaller trees in the level. This is what we have so far. He does not look like Bartleby quite yet, but you can definitely see the direction we are going. In the next post I will show you how we added a texture to his surface that resembles bark, moss and leaves — everything that looks like a tree! 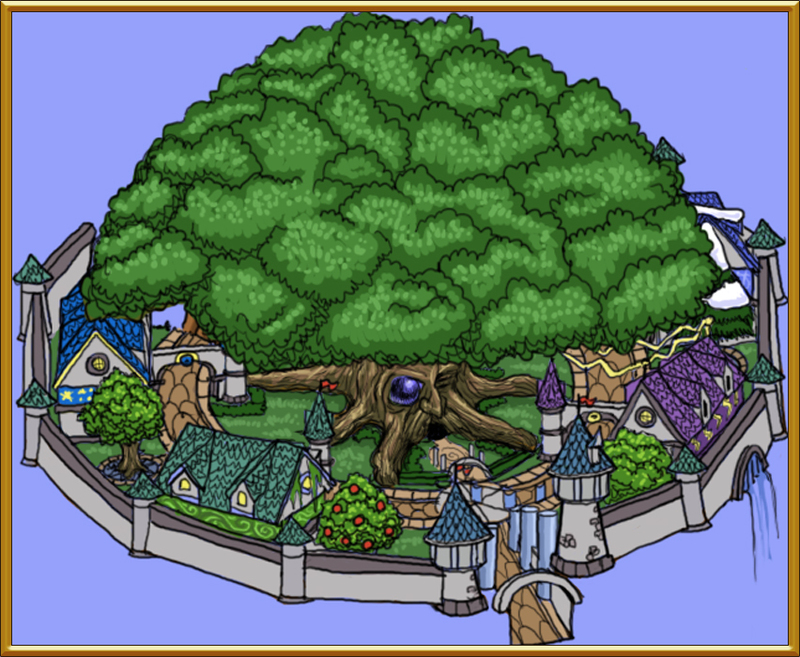 Stay tuned for part 3 where we will turn Bartleby into the final tree that you know and love in Wizard101. I can’t wait for the last episode. I think that Bartleby’s evolution was pretty cool. By the way KingsIsle, there should be a new world where you get to battle all your teachers and the final boss of the world can be Merle Ambrose and he can be like “Hello not-so-young-wizard anymore, Do you wish to test your strength? and if you reply with the Accept button you meet him in a secret room in the top of his tower in Wizard City and you try to defeat him.